The Lions' Share: Where were you last week, Mrs. Librarian? Where were you last week, Mrs. Librarian? The TLA or TxLA is just about the biggest professional development conference for librarians in the United States. Last year over 7 thousand people attended the event in Austin. I haven't seen a posted number for this year's attendance, but the sessions and events were full, despite the Houston floods. In addition to the conference goers, there are thousands of vendors along with the presenters and, of course the rock stars, I mean, the authors. Technically the event is called the Texas Library Association Conference, but that's just too much to say in our acronymic society, thus it is referred to as the "TLA", i.e., "Are you going to TLA this year?" What happens at the TLA? A lot. Where to start? The main reason we go to the conference is to learn from others in our field how to better do our jobs as librarians. We learn about new resources, technologies and books. We collaborate to address issues of concern and to talk about challenges we and/or our teachers face and how we can lead and help on our campuses. Here is a breakdown of some of the things that go on at TLA. There anywhere from ten to twenty different session choices at every given hour, so making the best choice is one that the attendee grapples with continually. Do you go to the session about Google certification or would it be better to attend "Using Formative Assessment in Teaching Information Literacy"? There are sessions offered by known literacy and technology experts like Donalyn Miller and sessions offered by regular librarians who have ideas to share. Session topics fall under many categories like technology, collection development, library management, leadership, programming, teaching, diversity, social media, intellectual freedom/copyright, books and authors and more. There were over 400 sessions offered with over 1500 presenters, so there's something for everyone and something to address every need. Every year there is a preconference held called Tech Camp which is "a technology conference within a conference for School Librarians" (Texas, 31). The Tech camp starts a day before the conference officially starts but it does deserve mentioning. Here librarians learn about makerspaces, coding, augmented reality and other technology tools with a hands-on, more intensive approach. The TLA Innovation Lab provides a venue for participants to share and learn about makerspace programs. Authors are the main attraction - the rock stars. They come and speak on panel discussions such as "Fairy Tale Retellings in YA Literature" and "Diversity in Action with Elementary Literature." Noted authors and celebrities give motivational speeches. LeVar Burton (Reading Rainbow, Roots, Star Trek the Next Generation) delivered the Opening General Session for TLA this year. Other noted authors presenting and attending included: R. L. Stine, Katherine Applegate, Marissa Meyer, Barry Lyga, Kwame Alexander, and Jeff Kinney. New authors are introduced, award-winning authors recognized and famous authors are inundated with hordes of librarians seeking autographs and free advanced copies of books. You may wonder how all this grandeur is financed. Sure, there is a fee to attend TLA, but the fee is really a deal for all that goes on at TLA. The vendors and sponsors really provide the lion's share of the cost with their generous contributions. These contributions also help fund the big events like the Bluebonnet luncheon and the catered Grand Opening & Welcome. Of course they are all selling something: books, furniture, database subscriptions, interior design, college degrees, 3D printers, financial services, robotics, architectural services, publishing services, insurance, book fairs, author events and many more things. Many publishers give out free books, posters, buttons, t-shirts, book bags and chocolate to entice people to come to their booth to see what they have to offer. The exhibition hall also is where all the author signings occur. Every hour of the conference authors like Marissa Meyer, Jeff Kinney and Brandon Mull have books they'll sign and personalize. 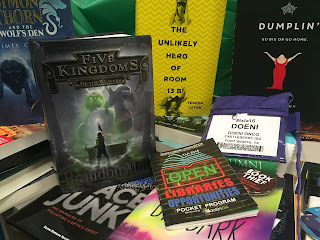 Many of the books are advance copies, free or at a special conference price, so it's a great deal and a potential prize that librarians can give to super, student readers or special teachers, or they can just put a copy in their library where many students can gain benefit. Sometimes being a librarian can be a lonely. Most often, there is only one librarian on the campus and while we do teach and work with students, we aren't the same as teachers. We are teachers, instructional partners, information specialists and program administrators. We serve many functions and seek to help many people in our campus: students, teachers, parents and our administrators. Coming to TLA allows us to meet with other librarians. We socialize, but we also learn and make connections with individuals who can enrich our programs and work with our teachers. 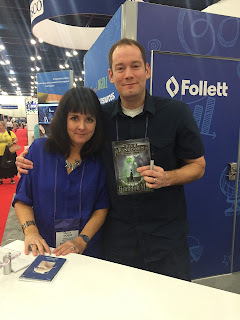 One author I met, a Spirit of Texas award-winner from Houston, would like to come teach a writing workshop with our students next year. There is much more to the TLA than can possibly articulated in a short blog. For instance, Castleberry librarians were afforded the unique opportunity of attending a portion of the 12th Annual Texas Library Conference on Raising Student Achievement for School Administrators and Trustees wherein our own Mrs. Smith-Faulkner presented: "Creating a Transformative Library Vision" to other administrators and stakeholders (Smith-Faulkner). It was tremendous seeing our administrator advocate for strong libraries in schools by showcasing what Castleberry ISD librarians do in their library programs. A big part of what we do as school librarians is to recommend new, quality books that encourage students to develop their reading skills and become more critical readers. A couple of us CISD librarians have been selected to be on reading program committees (Bluebonnet, Spirit of Texas). These committees help curate lists of quality literature and create educational programming and resources for the author/titles. Being able to attend committee meetings and meet and listen to authors on our lists is crucial to being contributing members of our committees. The conference is over, so now is the time to reflect and review what was learned. I am grateful for the opportunity to attend TLA and to be a contributing, active member of my profession and representative of Castleberry Independent School District. Smith-Faulkner, R. (2016). Creating a Transformative Library Vision [Emaze slides]. Texas Library Journal, 91(4), 2-66. (2015). Our runners up are: In the sixth grade: Kalub B. and in the seventh grade: Leslie H. They win a book, a poster and a North Texas Book Festival lanyard. Cesar G. is our grand prize winner! He wins the book bag, books , a North Texas Book Festival lanyard and button, a North Texas Teen Book Festival T-shirt and books! Many thanks to all who participated. We’ll do it again next year!